Because of the huge increase of the rate of fossil fuel carbon dioxide emissions in the past decade, we must expect reports of annual carbon dioxide increases exceeding 3 parts per million carbon dioxide, compared to recent trend increases of ~ 2 parts per million carbon dioxide per year. The surge of fossil fuel use, mainly coal, and rapid increases in atmopsheric carbon dioxide and nitrogen have "fertilised" the biosphere, "causing a large increase in net primary productivity of temperate and boreal forests", and hence an annual carbon drawdown of one billion tonnes a year. Increased carbon dioxide uptake "does not necessarily mean that the biosphere is healthier or that the increased carbon uptake will continue indefinitely". Increased short- term masking of greenhouse gas warming by fossil fuel particulate and nitrogen pollution is a "doubling down" of the Faustian bargain, an increase in the stakes: "The more we allow the Faustian debt to build, the more unmanageable the eventual consequences will be. Yet globally there are plans to build more than 1000 coal-fired power plants and plans to develop some of the dirtiest oil sources on the planet." Summary: Humanity is doubling down on its Faustian climate bargain by pumping up fossil fuel particulate and nitrogen pollution. The more the Faustian debt grows, the more unmanageable the eventual consequences will be. Yet there are plans to build more than 1000 coal- fired power plants and plans to develop some of the dirtiest oil sources on the planet. These plans should be vigorously resisted. We are already in a deep hole — it is time to stop digging. Humanity's Faustian climate bargain is well known (1,2). Humans have been pumping both greenhouse gases (mainly carbob dioxide – CO2) and aerosols (fine particles) into the atmosphere for more than a century. The CO2 accumulates steadily, staying in the climate system for millennia, with a continuously increasing warming effect. Aerosols have a cooling effect (by reducing solar heating of the ground) that depends on the rate that we pump aerosols into the air, because they fall out after about five days. Aerosol cooling probably reduced global warming by about half over the past century (3), but the amount is uncertain because global aerosols and their effect on clouds are not measured accurately. Aerosols increased rapidly after World War II as fossil fuel use increased ~5%/year with little pollution control (Fig. 1). Aerosol growth slowed in the 1970s with pollution controls in the U.S. and Europe, but accelerated again after ~2000. Figure 2. Annual increase of CO2 at Mauna Loa. The 12-month running mean reduces the double noise in the 12- month change. Blue asterisks show the end-of-year 12-month change often reported in the media. The rapid growth of fossil fuel CO2 emissions in the past decade is mainly from increased coal use (Figure 1), mostly in China with little control of aerosol emissions. It is thus likely that there has been an increase in the negative (cooling) climate forcing by aerosols in the past decade, as suggested by regional aerosols measurements in the Far East, but until proper global aerosol monitoring is initiated, as discussed below, the aerosol portion of the amplified Faustian bargain remains largely unquantified. In our current paper (6) we describe another component to the fossil fuel Faustian bargain, which is suggested by a careful look at observed atmospheric CO2 change (Figure 2). The orange curve in Fig. 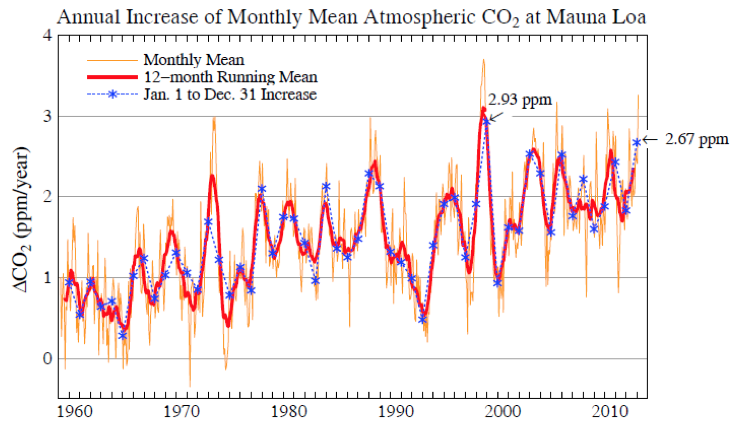 2 is the 12-month change of CO2 at Mauna Loa. This curve is quite "noisy", in part because it has double- noise, being affected by short-term variability at both the start-point and end-point in taking the 12-month difference in CO2 amount. A more meaningful measure of the CO2 growth is provided by the 12-month running mean (red curve in Figure 2). The temporal variability of the red curve has physical significance, most of the variability being accounted for by the Southern (El Nino–La Nina) Oscillation and the Pinatubo volcanic eruption in the early 1990s, as discussed in our paper. NOAA recently reported the second largest annual CO2 increase in their Mauna Loa record. What they report is the end-of-year change in the noisy orange curve, the end-of-year values being indicated by blue asterisks in Fig. 2. It is practically certain that still larger CO2 increases will soon be reported, because of the huge increase of the rate of fossil fuel CO2 emissions in the past decade (black curve in Fig. 1), indeed we must expect reports of annual CO2 increases exceeding 3 ppm CO2. An interesting point, however, is the failure of the observed increases in atmospheric CO2 to increase as rapidly as the fossil fuel source has increased. This fact is contrary to suggestions that terrestrial (7,8) and ocean (9,10) carbon sinks are tending to saturate as CO2 emissions continue. 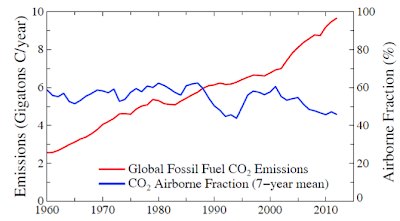 An informative presentation of CO2 observations is the ratio of annual CO2 increase in the air divided by annual fossil fuel CO2 emissions (11), the "airborne fraction" (Figure 3, right scale). This airborne fraction, clearly, is not increasing. Thus the net ocean plus terrestrial sink for carbon emissions has increased by a factor of 3-4 since 1958, accommodating the emissions increase by that factor. Remarkably, the airborne fraction has declined since 2000. The 7-year running mean had remained close to 60% up to 2000, except for the period affected by Pinatubo. 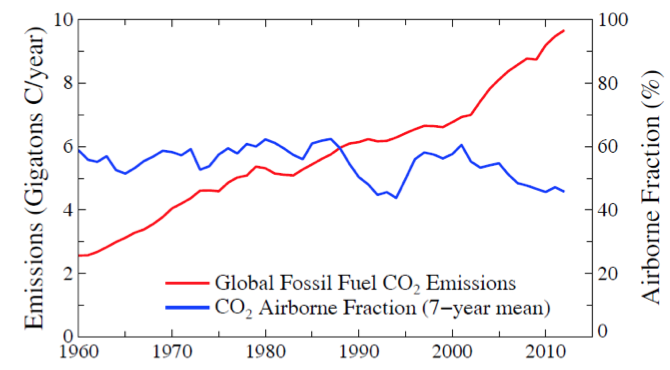 The airborne fraction is affected by factors other than the efficiency of carbon sinks, most notably by changes in the rate of fossil fuel emissions (12). However, the change of emission rate in 2000 from 1.5%/year to 3.1%/year (Figure 1), other things being equal, would have caused a sharp increase of the airborne fraction (because a rapid source increase provides less time for carbon to be moved downward out of the ocean's upper layers). A decrease in land use emissions during the past decade (13) might contribute a partial explanation for the decrease of the airborne fraction, but something more than land use change seems to be occurring. 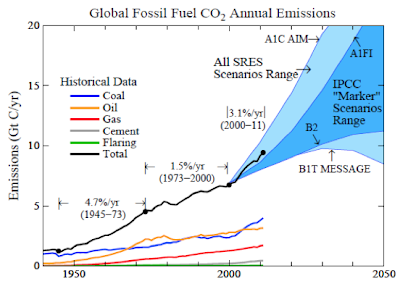 We suggest that the surge of fossil fuel use, mainly coal, since 2000 is a basic cause of the large increase of carbon uptake by the combined terrestrial and ocean carbon sinks. One mechanism by which fossil fuel emissions increase carbon uptake is by fertilizing the biosphere via provision of nutrients essential for tissue building, especially nitrogen, which plays a critical role in controlling net primary productivity and is limited in many ecosystems (14). Modeling (15) and field studies (16) confirm a major role of nitrogen deposition, working in concert with CO2 fertilization, in causing a large increase in net primary productivity of temperate and boreal forests. A plausible addition of 5 TgN/year from fossil fuels and net ecosystem productivity of 200 kgC per kgN16 yields an annual carbon drawdown of 1 GtC/year, which is of the order of what is needed to explain the post-2000 anomaly in airborne CO2. Independent of a possible aerosol effect on the carbon cycle, it is known that aerosols are an important climate forcing. IPCC (17) concludes that aerosols are a negative (cooling) forcing, probably between -0.5 and -2.5 W/m2. Hansen et al. (18), based mainly on analysis of Earth's energy imbalance, derive an aerosol forcing -1.6 ± 0.3 W/m2, consistent with an analysis of Murphy et al. (19) that suggests an aerosol forcing about -1.5 W/m2. This large negative aerosol forcing reduces the net climate forcing of the past century by about half. So is the new data we present here good news or bad news, and how does it alter the "Faustian bargain"? At first glance there seems to be some good news. First, if our interpretation of the data iscorrect, the surge of fossil fuel emissions, especially from coal burning, along with the increasing atmospheric CO2 level is "fertilizing" the biosphere, and thus limiting the growth of atmospheric CO2. Also, despite the absence of accurate global aerosol measurements, it seems that the aerosol cooling effect is probably increasing based on evidence of aerosol increases in the Far East. 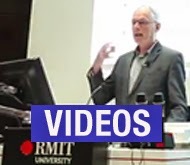 Both effects work to limit global warming and thus help explain why the rate of global warming seems to be less this decade than it has been during the prior quarter century. This data interpretation also helps explain why multiple warnings that some carbon sinks are "drying up" and could even become carbon sources, e.g., boreal forests infested by pine bark beetles (20) and the Amazon rain forest suffering from drought (21), have not produced an obvious impact on atmospheric CO2. However, increased CO2 uptake does not necessarily mean that the biosphere is healthier or that the increased carbon uptake will continue indefinitely (22). 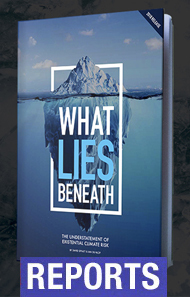 Nor does it change the basic facts about the potential magnitude of the fossil fuel carbon source and the long lifetime of fossil fuel CO2 in the surface carbon reservoirs (atmosphere, ocean, soil, biosphere) once the fossil fuels are burned (23). Fertilization of the biosphere affects the distribution of the fossil fuel carbon among these reservoirs, at least on the short run, but it does not alter the fact that the fossil carbon will remain in these reservoirs for millennia. The principal implication of our present analysis relates to the Faustian bargain. 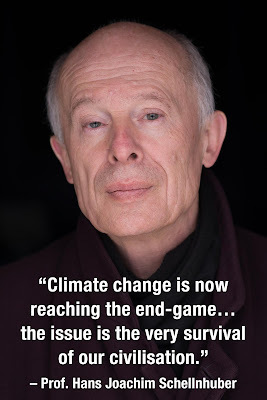 Increased short- term masking of greenhouse gas warming by fossil fuel particulate and nitrogen pollution is a "doubling down" of the Faustian bargain, an increase in the stakes. The more we allow the Faustian debt to build, the more unmanageable the eventual consequences will be. Yet globally there are plans to build more than 1000 coal-fired power plants (24) and plans to develop some of the dirtiest oil sources on the planet (25). These plans should be vigorously resisted. We are already in a deep hole -- it is time to stop digging. The tragedy of this science story is that the great uncertainty in interpretations of the climate forcings did not have to be. Global aerosol properties should be monitored to high precision, similar to the way CO2 is monitored. The capability of measuring detailed aerosol properties has long existed, as demonstrated by observations of Venus.26 The requirement is measurement of the polarization of reflected sunlight to an accuracy of 0.1%, with measurements covering the spectral range from near- ultraviolet to the near-infrared at a range of scattering angles, as is possible from an orbiting satellite. (27,28,29) Unfortunately, the satellite mission designed for that purpose (30) failed to achieve orbit, suffering precisely the same launch failure as the Orbiting Carbon Observatory (OCO). Although a replacement OCO mission is in preparation, no replacement aerosol mission is scheduled.